It seems that everything is blooming in blues and purples right now in the Rosehaven Cottage gardens. It is a wonderfully serene yet vibrant show that's going on. Blue and purple flowers always amaze and entrance me. I've been reading the book "Flower Confidential" by Amy Stewart. One of the fascinating things in the book is the discussion of how the color of a flower is determined by its internal chemical makeup at a cellular level. There's a lot of science behind it (I won't bore you with the details), but it is a fact that some flowers cannot be blue unless genetically altered. Because of this, no one has yet been able to breed a true "blue" rose. The last I heard, no one has been able to breed a truly "scarlet red" bearded iris for the same scientific reasons why no one can breed a "blue" rose. Frankly, I'm happy with the fact that in order to have blue AND red flowers in my garden I have to have both iris and roses. 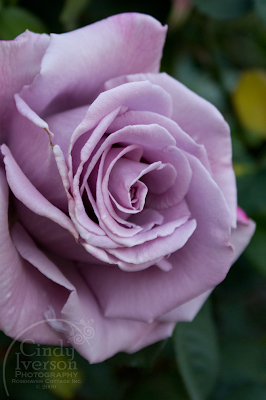 And even though it isn't really "blue", I think that the "Blue Ribbon" rose is absolutely beautiful. With its dusky scent it smells like the old rose perfumes from decades ago. When I smell it, I am transported back to standing at my Grammy's dressing table when I was 6 years old sniffing all the lovely potions and lotions. If I really stop to think about it, each one of the flowers pictured here reminds me of my Grammy and her garden. Even the subtle scent of the bearded iris has that connection for me. Isn't it interesting how scents and smells from positive early childhood experiences continue to attract us, particularly women? What color and scent are the blooms that remind you of happy and content times in your life? Bearded iris remind me a being a little girl. My dad is a vet and I used to go on large animal calls with him. One of his horse clients giving me an iris bloom. May have been the first flower anyone ever gave me. Very sweet. Such beautiful flowers. Thank you for taking me on a walk around your garden. Roses, pink ones, remind me of my mother. Pansies also remind me of her when she was young. Camellias: my grandmother. Dahlias: my paternal grandmother. Certain kinds of wood smoke evoke for me memories of our years living in the interior of Papua, Indonesia (island of New Guinea). I read somewhere that smell is the strongest memory maker of all the senses. I found this post very interesting- some things I knew but others I didn't. I have heard that we remember smells longer than any other data from another one of the senses. I believe it. Every now and then in a crowd I'll catch a whiff of something that smells just like my Grandpa who died in 1994 yet I can completely recall the smell when I smell it again. As for memory scents for me- that's easy. Jasmine. On our Honeymoon we were waiting for a boat to come in and take us out to Catalina Island and the whole hillside behind us was covered in Jasmine in full bloom. I also remember the scent of Plumeria from my trip to Hawaii with my dance troupe when I was 16. Oooh, I love lilacs. Lucky you! Peonies are among my favourite flowers too, although I like just about all of them. This post reminds me of all the times I would go into my mom's room and smell the perfume bottles she had on her dressing table. They always smelled so grown up and sophisticated. Ok, we need smell-o-computer. I want to smell those lilacs! Hi Interesting blog. I too love roses. I see you have a Cecille Brunner, mine is not a climber and came from a cutting of a dear neighbour who has since died. It was some years before I was able to identify the name of it but it is very distinctive rose bud flower. I have taken several cuttings successfully over the years so have three bushes now doing well. I love the honey smell of buddleia as it reminds me of the huge bush that flowered outside my window at my Grandmother's house. My fav smell is rose- the old fashioned sort. My daughters plant a patch of zinnias outside the kitchen window each spring, so that by mid summer, outside the kitchen tower 3foot blooms, and monarch butterflies, and yellow finches. So those deep summer hues of the zinnias do it for me! 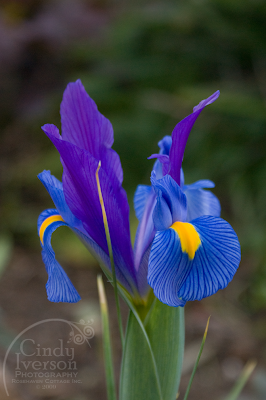 The Dutch Iris is breathtaking! I love the vivid blueish-purple colors. Absolutely incredible flowers. Your garden must look like a corner of Heaven. The smell that can most quickly transport me back in time is the sweet, sweet smell of Mayblowers (trailing arbutus), Nova Scotia's provincial flower. A trip to Mayflower Springs to look for mayfowers--often under inches of snow in their woodland home--was one of the things that truly signalled spring back then, and still does. We used to make little nosegays for our mothers and those few blooms would perfume the entire house for days. Sweet! I just LOVE Blue Ribbon. I once had a Blue Girl (I think) that was very similar. I don't think a true blue rose would actually look good. 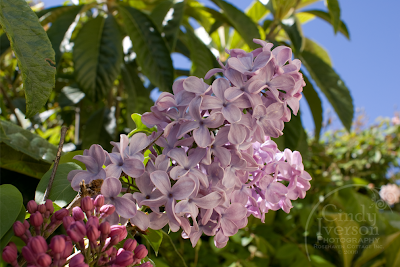 Whenever I see and smell lilacs, I think of the time my grandma told me how people used to plant them near their kitchen windows or back door, so the scent would greet visitors, or send the scent into the house. I love that thought! Your Dutch Iris is lovely! 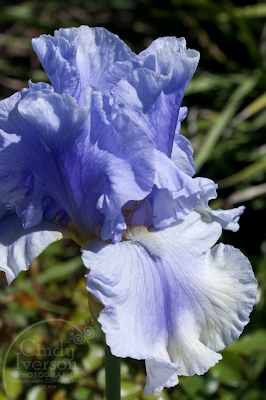 Like reticulated iris, they seem to have such intense color and sharp detail, compared to bearded irises. Thanks for sharing your beautiful flowering wonders with us! I love all the flowers you showed, especially the Dover Beach Iris-it is beautiful!! Your flowers are so beautiful! My lilacs are just beginning to leave out. No buds yet. That dutch iris is exquisite. WOW, I literally gasped as it scrolled up the page!!! My grandmas yard was full of phlox, and I had no idea that I associated that smell with visiting her until dad put in phlox in our yard (grandma lived far away, so we visited perhaps once every other year). Ironically, I'm not all that close to her, but I do LOVE that smell. I also LOVE lilacs. They smell so wonderful, but my mother is allergic so we could never bring them into the house. When I got married that was one of the first things I did--bring lilacs into the house. LOL! Visually, I suppose I'm still a sucker for roses...I really love the joseph's coat, and we had a dark salmon-orange one that smelled just divine.